Johnny Hamilton (right) in action during a recent game. 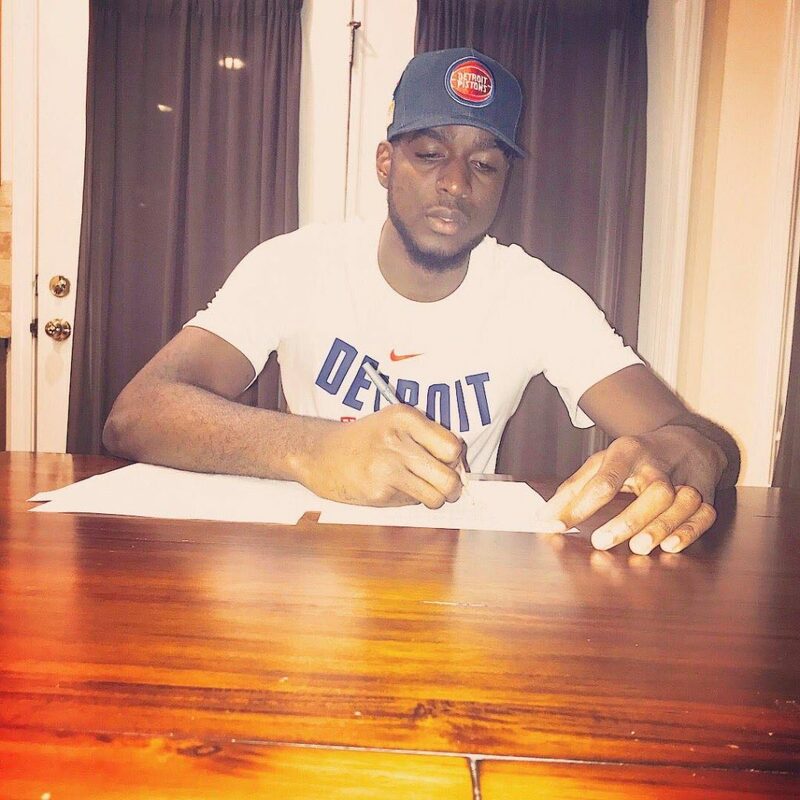 JOHNNY Hamilton, a 24-year-old who was born and raised in Rio Claro, signed his first professional basketball contract with the Detroit Pistons on Tuesday. Hamilton and Pistons agreed on a partially-guaranteed one-year deal after he impressed at the NBA summer league. Non-guaranteed contracts are typically given out to players who are drafted in the second round, fringe players or those whose who may be beyond their prime. They are paid for each game they are named on a roster and can be cut by a team at any time. Following the signing Hamilton, a seven-foot-tall centre, took to several of his social media accounts to post: “What a day to be alive. Thanks to the almighty, my family and coaches for having my back and helping me grow into the man I am today. I couldn’t do it without y’all. Johnny Hamilton signing his contract with the Detroit Pistons on Tuesday. 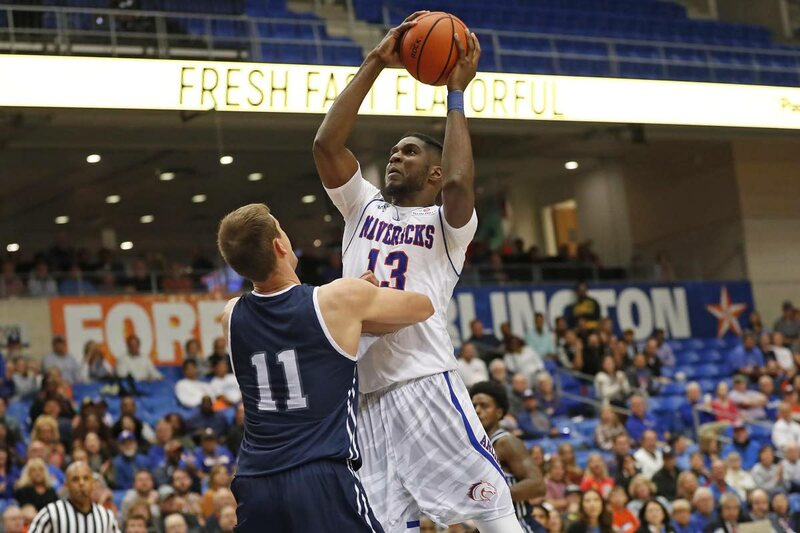 Following a two-year stint at Virginia Tech where he was seldom used, Hamilton transferred to the University of Texas-Arlington where he got more experience with playing time. Last season in Arlington, Hamilton averaged 11.1 points, 8.1 rebounds and 2.3 blocks per game last season. He then challenged the summer league where in just 12.7 minutes per game, he averaged four points, 6.7 rebounds and 1.7 blocks. He can now train and potentially play alongside experienced campaigners in Andre Drummond and Blake Griffin. The news was welcomed but not very surprising to his mother, Princess Hamilton, who said this move was one he dreamt of and had every intention of pursuing. Princess added that she and the rest of his family were happy that his efforts were paying off. Hamilton (Johnny) comes from a family of basketballers. His brother Jesse is 6’11” and plays locally for Police. His father, standing at 6’7” was also a competitive player, who went by the nickname “Cornbread”. Johnny was an avid footballer in his youth, according to Princess, but as he got older and grew taller, he abandoned the sport to pick up basketball. “He started basketball late, around 16 when was at St Augustine (Senior Secondary),” she said. Reply to "From Mayaro League to NBA"